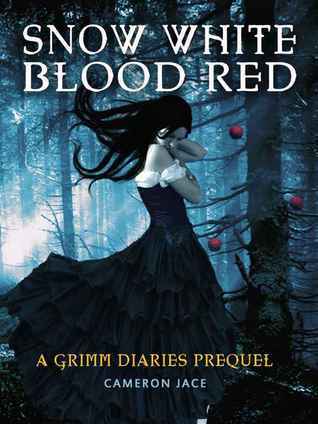 Snow White Blood Red (The Grimm Diaries Prequels) by Cameron Jace. Publication : (Self-Published) May 29th, 2012. I haven't read/reviewed any indies in a while (except for books by J.L. Bryan which I absolutely love) because I just haven't had the time to accept any but I'm a huge sucker for fairytales so, when I was contacted by Cameron Jace to review Snow White Blood Red, considering it was just a novella and wouldn't take me long to read, I accepted right away. I only realized after I read it that the first book in the The Grimm Diaries series, namely Snow White Sorrow (which isn't out yet) has been on my wishlist since May, 2012. First off, I'm the kind of person who judges a book by its cover and I have say, I love this cover. Snow White Blood Red is an incredibly unique take on fairytales, Snow White and happily ever afters. It's the first of around 5 prequels to the actual series known as The Grimm Diaries and in this series, Snow White's the evil one. I'm completely fascinated with the idea for this series and I love that each prequel gives us a bit from various famous fairy tale characters such as Peter Pan, Prince Charming etc. The Evil Queen's perspective was certainly interesting and held me captivated. Her voice, for the most part was strong but I would've liked this to be a full-fledged fantasy novel rather than a mix between the present world and fairy tales as the random slang usage kind of ruined it for me a little bit. However, despite the unique idea, the writing and editing are flawed. Honestly, I'm not sure if it was edited at all in the first place but the story has potential to be amazing. I'll definitely read Snow White Sorrow just for the creativity alone; I just hope it's edited better than this one. If I heard about this several months ago I think I'll pick it up because of the story esp the villain's perspective but with the amount of movies/tv series coming out told in the villain's POV, the storyline of this feels "old". I love that kind of re-tellings! And a random thing - did you read uncensored, original Grimm brothers' stories? They are real horrors. Anyway, it's one of the best covers for shelf-published books I have ever seen!